In a busy life, you don’t always find the time to sit back and enjoy the highlights of the tournaments you’re involved in. No sooner is an event finished then I am straight back to work in my day job, so finding the time to sit down and enjoy some squash videos is a rare treat. Today, having returned from a short holiday in the West Country, I had planned to cut the grass and do a million other chores that need doing in the garden. However, the rain put paid to those plans and, with my wife heading off to Bluewater for a shopping spree with our daughter, I find myself alone at the laptop and trawling through the highlights of this year’s Canary Wharf Classic and the recent British Open. Of all the fantastic rallies, one name stands out head and shoulders above all the others. No, not Nick Matthew’s triumph over Ramy Ashour at the O2 Arena, or, indeed, Ramy’s magnificent win over James Willstrop the day before. 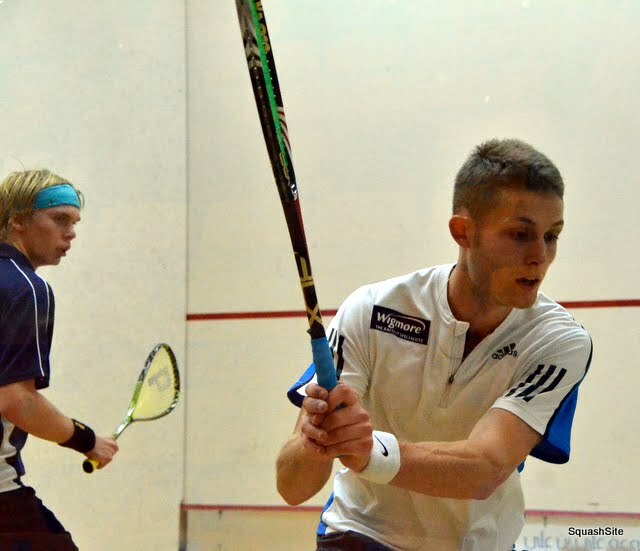 There were plenty of amazing matches at Canary Wharf, as Willstrop was tested by both Saurav Ghosal, Tarek Momen and Mohamed El Shorbagy before falling to Matthew in a physically draining final. No, the clip that made me sit up and smile most of all was Robbie Temple’s astonishing hand co-ordination as he showcased his phenomenal ambidextrous grip against Daryl Selby. A leftie with a two-handed backhand, Temple can also play right-handed when he wants to. Just watch this clip from the East Wintergarden at Canary Wharf as he changes effortlessly from one grip to another and then finishes the rally with a crosscourt volley nick – using his right hand!